The energy and utility industries are rapidly changing to meet the demands of their markets. We are seeing the conversion of existing fossil fuels and nuclear power plants to comply with new legal regulations, and the building from scratch of new plants for the generation of electricity from renewable energies. These projects tend to be complex in the lifting and movement of heavy components. Plant sections are generally assembled on-site, which also requires special lifting and assembly machinery. Our customers in the energy and utilities industry are able to benefit from our comprehensive fleet of well-maintained equipment and years of experience gained in the field. With our support, you can relax in the knowledge that your equipment will be provided to your project with a minimum of investment and with the utmost precision. FGD Projects, SCR Projects, Turbine Work, Air Feeder Work, Boiler Outages, Air Heater Outages, Coal Pulverizers, and Coal Conveyor Systems. Robins & Morton performed the sliding of two condenser units underneath a steam turbine tabletop using a rented HT Hydra-Slide™ Skidding System from Lifting Gear Hire. With only one to four inches of clearance on top and only two inches on each side in order to effectively and safely slide the units, Calderone and his team knew it wouldn’t be easy. Advantage Industrial Machinery Relocators Incorporated (A I M) was hired to complete the sliding of an electric fan motor. 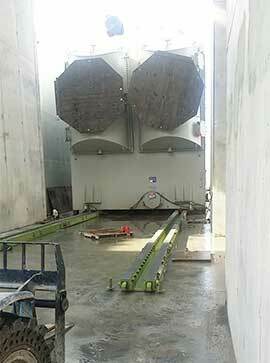 Several challenges presented themselves in the course of the project to slide the large electric booster fan motor. What made the slide very challenging was the fact that the slide had to be accomplished fourteen feet above the ground. That was the height of the pedestal that the booster fan motor would rest upon. They had to raise the trailer and then crib up the motor off the trailer to allow them to put the rails in place and slide it off the trailer onto the stand, all while elevated fourteen feet above the ground. BMWC Constructors, Inc. (BMWC) was challenged to perform the setting of (2) 15’ x 52’ cooling tower unit sections within an active, working refinery. 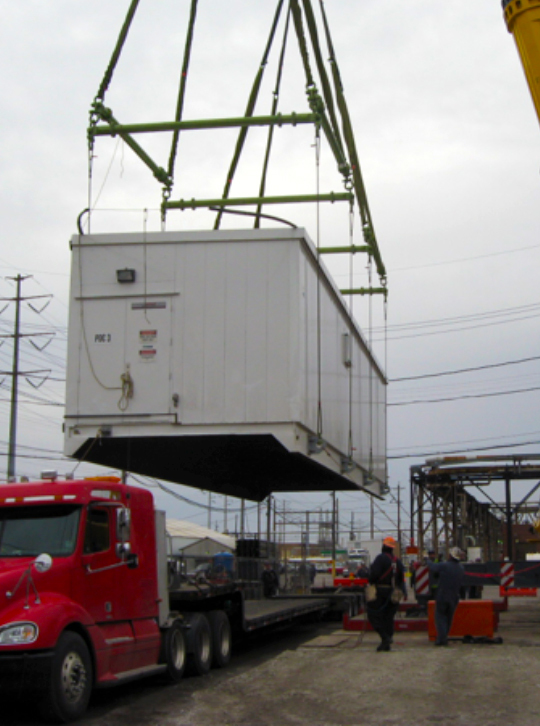 While being responsible for the coordination of a 550-ton crane, submitting an engineer lift plan for approval, as well as the site prep work needed to meet the project soil compaction requirements, BMWC was also responsible for the removal of the HVAC/scrubber units. 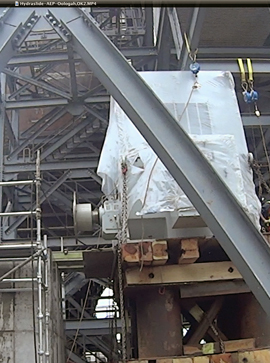 BMWC ironworkers, carpenters, laborers and operators worked together to complete the project, while turning to Lifting Gear Hire for expertise in developing a lift plan and for supplying the appropriately sized, tested and certified lift equipment. This project was a critical lift inside of an active refinery. The work had to be complete while the refinery day-to-day operations were still in effect without disruption and within a tight schedule.